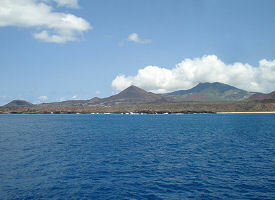 It looks like a small island, but Ascension is actually the top of a 10,000 foot volcanic mountain. A "working" island ever since the Portuguese first came ashore in 1501 and made it a supply station for their northbound ships, it has no permanent residents. Inaccessible crags and offshore Boatswain Island are the main breeding grounds for an amazing variety of bird species, including the Ascension frigate bird. At certain times of the year, endangered green sea turtles are drawn to the island's beaches to nest and lay their eggs.